One-stop Shop: Steve’s Auto Care makes it easy for you by providing a comprehensive list of services. Performed by our ASE-certified technicians using the most up-to-date diagnostic procedures and tools. We’ll help you select the best tire to get the most out of your car. After all, the only thing between you and the road are your tires. Recommended once a year to prevent premature tire wear and to improve fuel efficiency. Protect your investment; see what servicing may be needed before you buy. We are a certified smog test and repair station (we are not a test only station). One of the most important repairs peformed on your car. Don’t neglect your brakes; servicing them will save you time and frustration in the long run. Recommended every 2 years or every 30,000 miles. Required to complete DMV resgistration. 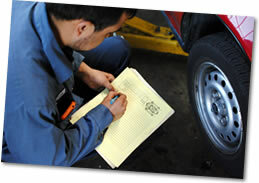 Our State-certified inspectors will make sure your vehicles’s brakes and lamps meet State standards and requirements. Click Here to download our Lamp & Brake Preparation Sheet. We are certified to service and repair A/C systems, R13 or 134-A. Steve’s Auto Care offers a free courtesy shuttle for the convenience of customers.